Today, we are at the 28th of Ramadan 1430H. This means Ramadan is leaving us really soon. How has your Ramadan been up to now? As for me, it was a challenge right from Day 1. But I have hopes that Allah took mercy on my soul, took pity of my weaknesses and still pardon me at the end of this Ramadan, ameen. And I pray the same for you too, my brothers and sisters. And as how there is always the other side of the coin, when daytime leaves nighttime arrives and how when something goes up it must come down- when something goes, there will be another thing that awaits, right? That is how life goes for us..
And with the leaving of holy and blessed month of Ramadan, awaiting us is the month of Syawal, alhamdulillah. This is the month when Allah has allowed us to celebrate our success and victory in withstanding His test and command made upon us, you agree? Even if the command is against our natural habits like eating and drinking, alhamdulillah. Of course, there are always definite reasonings and benefits of why Allah has command us to fast, right? But that is not the point in today's post. 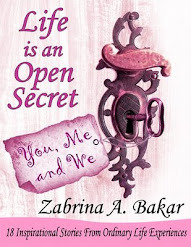 Therefore, for Friday's Reflection Story this week, I am posting the last story from my latest book: Life is an Open Secret- Ramadan Special for your reading pleasure. Hopefully, inshaAllah, we will all benefit from it. That day I woke up at my usual hour with a smile. Another day alive, another day living and another day breathing, SubhanAllah and Alhamdulillah, I whispered to myself. I absolutely love waking up during such wee hour in the morning. Nothing can beat morning time for me. 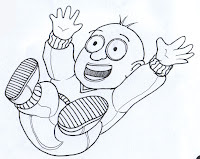 I remembered how I accidentally irritated a few of my friends by being so chirpy, bubbly and happy so early in the morning! “Sorry, you guys, I am a morning person, I can't help it!”, I said to them as they groggily and sleepily took their towels making their way to the ladies for their morning bath. I don't know exactly what it is about mornings that I love so much. Perhaps it is the silence, the stillness, the calmness, the tranquility and the quietness that totally gives clarity, peace and serenity to my heart, mind and soul, Alhamdulillah. Yes, each morning is truly a new beginning, you agree? As I continued doing what I usually do in the morning, I suddenly heard a melodic voice, saying the beautiful, peaceful and soothing words that acknowledge the Greatness of One God, One Lord, Allah the Al Mighty, subhan Allah. (Allah is Most Great, Allah is Most Great, Allah is Most Great, there is no god except Allah, Allah is Most Great, Allah is Most Great , Allah is Most Great, and all praise be to Allah). This only denotes one thing- First day of Shawwal is here. Indeed, the sound of Takbir, glorifying our Lord has never failed to bring tears to my eyes, deliver serenity and peace to my heart and put a smile to my face…. Allahu akbar… Allahu akbar… Allahu akbar…. Immediately, I started thinking. What should I do now this very first day of `Eid? Our beloved Prophet Muhammad (peace and blessings be upon him) ate dates before going to the mosque, my friends. Dates! Not cookies, not cakes and sure not biscuits too! Immediately, I went to the kitchen, opened up my refrigerator and grabbed hold of those healthy yummy dates. So, again my dearest friends, 'Taqaballahu minna wa minkum’ [may Allah accept (our deeds) from you and us]. And as I reflect on the first day of my graduation from my 30-days of Intensive Training Camp, and with the release of my biggest avowed enemy ready to ‘pounce’ on me anytime now, I pray to Allah that my Self-Restraining Training has benefited me and has changed me into the Zabrina 2.0 version I so much want to be. At the same time, I pray that Allah, my Lord, my Creator the Most Merciful will continue to bless me with strength, willpower and determination befitting of the Graduate of Ramadan Class 1429H, ameen. Allah is Most Great , Allah is Most Great, and all praise be to Allah). 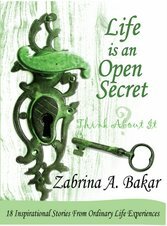 Secret 25: ‘Eid ul-Fitri is taken from one of the 25 stories in Sis Zabrina's book: Life is an Open Secret- Ramadan Special. Life is an Open Secret- Ramadan Special carries 25 motivational and inspirational stories specifically tailored for the month of Ramadan when Muslims worldwide are required to observe the act of fasting from dawn until sunset for a period of one month. This special month brings along with it many benefits and blessings that are sometimes forgotten. Thus, the stories in this book serve as a reminder as to what Ramadan is truly about. All stories are written in a simple, chatty, humorous and witty way that promises to touch your heart, tease your mind, soothe your soul and make you reflect along the way. If you are curious to know what Ramadan is about, this is the book for you. If you want to know why Ramadan is important, your curiosity stops here. If you feel you have lost the essence of Ramadan, this book shall remind you. If you think fasting is only about not eating and drinking, you need to read this book. If you dream of becoming a better person this Ramadan, flip the pages of this book. If you wish to improve spiritually this Ramadan, find them all here within the pages. If you are seeking for the blessings of Ramadan, this book has secrets to share. If someone you love needs a reminder of Ramadan, send this book to him or her as a gift. Life is an Open Secret. Always has been. Always will be. Thanks for the great stories, they really are inspiring! Keep up the postings!